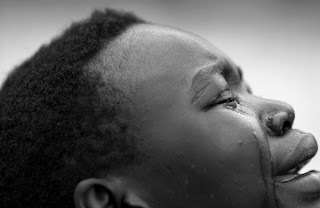 The mere mention of the word 'Africa' sets me into a myriad of emotions. Not only is this because I have a personal attachment to the continent, but because I have learned many things about the multiple injustices the people of Africa face everyday. When Dominic introduced the disease we call sleeping sickness in our class, he immediately caught my attention. My soon-to-be father-in-law has spent his life researching the parasite that causes the disease in his laboratory at the University of Saskatchewan, dragging his family to Kenya for 3 years (30 years ago) in order to investigate the parasite in its own habitat. During my graduate degree, two years ago, I took a Medical Anthropology course which spent a lot of time discussing the disease, the devastation it causes, and the political controversies and injustices that continue to progress surrounding the medication used in treating the parasite. Most recently, last year I spent two months volunteering in a government hospital in Kenya, Africa often aiding patients that were suffering from the complications that this disease causes. I was immediately interested in learning more about how the parasite works when Dominic introduced it in our Biology class. Human African Trypanosomiasis, also known as sleeping sickness, is a vector-borne parasitic disease caused by the protist kinetoplastid Trypanosoma (1). Kinetoplastids are characterized by a single, large mitochondrion that contains an organized mass of DNA called a kinetoplast (2). 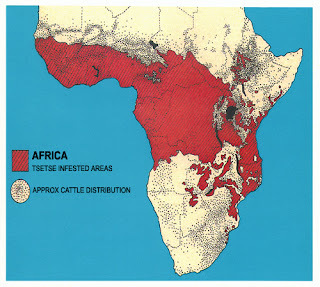 The protist is transmitted to humans by the bite of the tsetse fly which have acquired their infection from human beings or from animals harbouring the human pathogenic parasites (1). While taking blood from a human host, an infected tsetse fly injects metacyclic trypomastigotes into the skin tissue (3). Inside the host, they transform into bloodstream trypomastigotes, are carried to other sites throughout the body, reach other blood fluids such as lymph, and spinal fluid , and continue their replication by binary fission (3). The first stage of the disease, known as the haemolymphatic phase, entails bouts of fever, headaches, joint pains and itching (1). Due to the fact that the parasite migrates to the lymph system, lymph nodes often swell up to tremendous sizes. Winterbottom's sign, the telltale swollen lymph glands along the back of the neck may appear. If untreated, the disease slowly overcomes the defenses of the infected person, and symptoms spread to include anemia, endocrine, cardiac, kidney diseases and disorders (3). The second stage of the disease begins when the parasite passes through the blood-brain barrier. The symptoms of the second phase give the disease its name; besides confusion and reduced coordination, the sleep cycle is disturbed with bouts of fatigue punctuated with manic periods progressing to daytime slumber and nighttime insomnia (1;3). Without treatment, the disease is fatal, with progressive mental deterioration leading to coma and death (1;3). - Trypanosoma brucei gambiense is found in west and central Africa. This form represents more than 90% of reported cases of sleeping sickness and causes a chronic infection. A person can be infected for months or even years without major signs or symptoms of the disease. When symptoms do emerge, the patient is often already in an advanced disease stage when the central nervous system is affected (1). 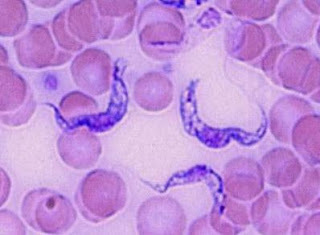 - Trypanosoma brucei rhodisiense is found in eastern and southern Africa. This form represents less than 10% of reported cases and causes an acute infection. The first signs and symptoms are observed after a few months or weeks. The disease develops rapidly and invades the central nervous system (1). The most devastating yet interesting thing about the Trypanosoma parasite evolutionary and diversity wise is its ability to evade the human immune system. Trypanosoma parasite lacks intracellular stages which makes the parasite a target for human antibody-mediated destruction (4). Indeed, many trypanosomes are cleared from the blood by liver macrophages; however, the remaining parasites survive and establish the infection due to their ability of antigenic variation of their variant surface glycoprotein [VSG] (4). Each trypanosome carries a large repertoire of VSG variants with different primary sequence and expresses a single VSG gene at any one time by replacing the previous gene at the telomeric active site of transcriptional expression with the new one (4). As a result, this repeated antigenic change of the VSG in trypanosomes allows them to evade the thymus-dependent humoral response, resulting in successive surges of parasitemia, a situation similar to being infected successively by related, but not identical pathogens (4). Due to this ability in the parasite, it makes it extremely difficult to develop a vaccine targeting the disease. Since the pathogensis is linked to the inability of the patient to eliminate the parasite, attempts have been made to determine how the parasite interacts with the immune system and disturbs the balance of cytokines and other mediators, thus allowing the pathology to progress (4). This theory has provided the basis by which my soon-to-be father-in-law has spent 45 years of his life investigating.....since they still haven't found a vaccine for the disease, I'd say that the parasite has a pretty evolved mechanism!! The history of treatment for sleeping sickness began with the introduction of an arsenic based compound called, Atoxyl, for the treatment of the disease (5). In 1920 a drug called, Suramin, was used to treat the first stage of the disease (3). By 1922, Suramin was generally combined with Tryparsamide, less toxic than Atoxyl, in the treatment of the second stage of the gambiense form (3;5). Suramin was used during the grand epidemic in West and Central Africa in millions of people and was the main form of therapy until 1969 (3). Pentamidine, another drug that was seen as highly effective in the first stage of the disease, began to be used in 1939. During the 1950's, it was widely used as a prophylactic agent in Western Africa, leading to a sharp decline in infection rates. At the time, it was thought that eradication of the disease was at hand......they were wrong (3;5). In 1932, 700 patients became blind after receiving the wrong dose of Atoxyl (5). In response to this disaster, a Swiss physician and chemist named, Professor Friedham, developed the drug Melarsporal, the bold concept of which was a single product containing a highly toxic arsenic-based molecule and its antidote (3;5). Melasporal was effective in controlling the disease; however, because it is arsenic-based, when injected it is extremely painful and burns the veins used for treatment (6). Additionally, 3-10% of patients injected have reactive encephalopathy and 10-70% of such cases result in death; also causing irreversible brain damage in those who survive the encephalopathy. Psychological effects from the drug are not uncommon and many patients have to be tied to their bed during treatment (6). Due to its effectiveness; however, Melasporal is still used today (3;6). 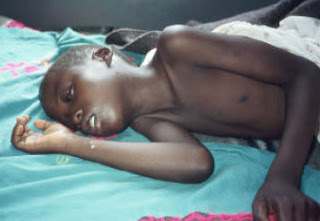 The most modern and safe treatment for sleeping sickness is a drug called Eflornithine. The drug was developed in the 1970's by Albert Sjoerdsmanot and underwent clinical trials in the 1980's (3). The drug was approved by the United States Food and Drug Administration in 1990, and was extremely effective against sleeping sickness, producing very little side effects; however, the drug was dropped from production in 1999 due to the fact that it was unprofitable (3;6). Apparently millions of Africans infected with the disease that the drug cures, can't pay astronomical amounts for the drug, so the drug company responsible - Bristol Myers Squibb and Aventis - decided they were not going to produce it anymore (6). When a vigilant Medicins Sans Frontieres supporter discovered that 'Vaniqa' facial hair cream, containing Eflornithine, was being sold in the United States, for $54.00 a tube, the ensuing publicity mobilised the drug companies responsible to restart their production of the Eflornithine medication (6). Million of dying Africans weren't enough motivation to produce the drug, but apparently at $54.00 a tube, production of a facial hair cream, was more important. In 2001, Aventis, in association with Medicins Sans Frontieres and the World Health Organization, signed a long-term agreement to manufacture and donate the drug (3;6). In addition, Aventis handed over the patent rights for the drug to the World Health Organization (6). Although this sounds like a happy ending, resistance to Eflornithine is emerging as the parasite develops new mutations which help to resist the mechanisms of the drug. Combination therapy is sometimes necessary. The number of doses and time span for treatment has doubled while debates for how long the drug will be donated continue.....(7). Sadly, the tale of Sleeping Sickness and the political controversies surrounding the medication produced to aid in its symptoms is not a unique one. Currently, in modern corporate-dependent societies, all things medical have been commodified (7). Nowhere is this as clear as in the TRIPS Agreement (Trade-Related Aspects of Intellectual Property Rights), which pits the public health community and the poor against the vast resources of a multi-billion dollar industry (8). In short, as commodities, all forms of medical goods, services and access to them are controlled by profit-seeking interest groups and political cliques. Governments that buy access to those goods and services also ration them (7). The TRIPS Agreement recognizes patents and the right to protect them for profit. Due to the fact that the TRIPS Agreement is international in scope, it allows countries in which a drug has been patented to prevent other countries from producing generic strains of a drug for which profitable royalties cannot be paid to the patent holder (7). Even when another country has bought production rights, it cannot sell its generic product to another country that does not have production capacity (7). In addition, the TRIPS provision that allows for the free flow of drugs in the face of epidemic diseases is not being honoured by the USA (7). Commodification has also led to the 'direct selling' of medicine to the public. It is a strategy intended by the pharmaceutical companies to expand their market (7). Where there are pharmacare programs, refusal to release a new drug is often intended to coerce governments into putting the drug on the list to ensure greater sales (7). As a result, these practices have chipped away at our system we call 'universal health care'. So,.....although evolution and diversity in parasites provides an interesting basis for us to research, investigate and solve problems; the issues surrounding treatment for parasites and other diseases becomes much more complicated and heated. Although I think studying Biology is a fascinating Science, I also think it's important to recognize its relatedness to all aspects within our society; health-wise, politically, and socially. 2) Bergeron, D. (2007). Biology 124: Evolution and Diversity, lecture Notes. Camosun College. 4) Zambrano-Villa, S., Rosales-Borjas, D., Carrero, J. C., & Ortiz-Ortiz, L. (2002). How protozoan parasites evade the immune response. TRENDS in Parasitology, 18(6), 272 - 278. 6) Botting, H. (2005). Anthropology 324: Medical Anthropology, lecture notes. University of Victoria. 8) Reid, M., & Pearse, E. J. (2003). Whither the world health organization? The Medical Journal of Australia, 178(6), 9 - 12.